This summer hasn’t been the summer I expected. I’m not talking about the weather for the first six weeks or so, which, let’s face it, left a little to be desired. It’s just… well, I haven’t been basking in the happy summer glow I inhabit most years from June to August. I don’t know what this is. Mid-life woes? Trying to figure out what I want to be when I grow up? Realizing that we have only three more summers like this with H at home? Maybe I need a sports car. Or a horse. Or a trip around the world. Or lunch with a friend. Here’s what I do know: the nights lately are hard. They’re filled with restless and even very bad dreams. I’m late. I’m lost. I’m trying to get in touch with family and I can’t. I’m in trouble. I’m cast aside. I’ve lost my shoes and the road is wet. I meet my mother in an abandoned train station and she tells me that she’s sick, and scared. And I can’t help. I wake up most mornings frazzled and not at all relieved. In spite of the gorgeous weather we’re having. In spite of the sun. In spite of M by my side. In spite of everything I have and hold, and health and (relative) youth, in this peaceful and green valley. But here’s what calms me: I go down to the kitchen, and quietly, methodically gather the milk pail, the tote, the clean bottles, the funnel and its filter paper, the strip screen, the udder wash. I step out on the porch and Wellesley spots me and nickers. Then her babies start to cry, because they’ve been separated from her all night so that we can have the milk that’s collected overnight. And they want their mother. Now. But the crying doesn’t bother me now the way it did at first because I know they’ll calm down as soon as I get Wellesley on the milking stand where they can see her. And then I milk. I press my forehead against Wellelsely’s flank, while she’s grunting with happiness over her morning grain. Her milk comes easily and she never kicks. She’s a pleasure to milk. The babies watch through the slats in the gate of their stall. Quiet. Bright eyed. For these ten minutes, I’m complete and competent. I know what I’m doing and things… work. The animal smells are sweet. The foam on the top of the milk fizzles as the minuscule bubbles pop. Nothing more is asked for. 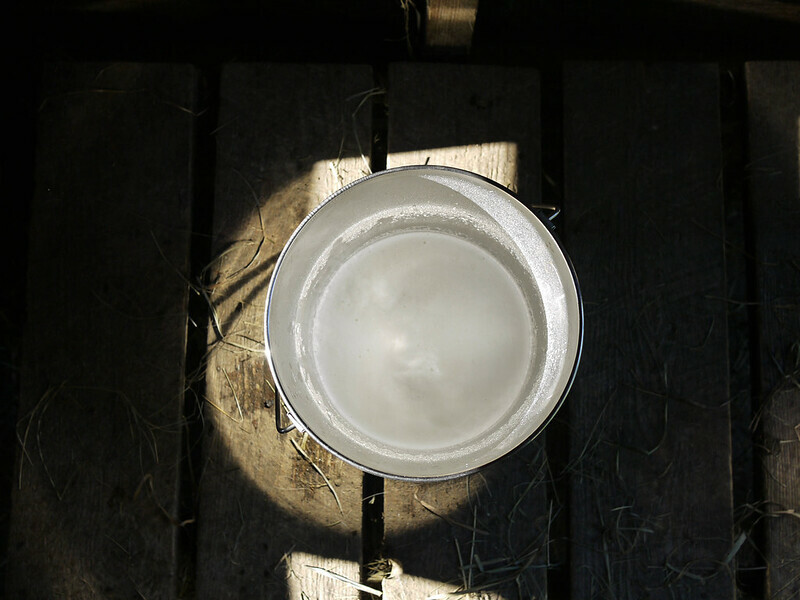 The day and the milk are fresh, and unspoiled. This photo and post are in response to this week’s theme for the 52 Photos Project. You should participate, too! Read about how it works here. You can see a gallery of everyone’s photos for this week’s theme here. To see a list of all my blog posts for this project, go here. I know how this must feel. I’m so glad you have some little snippets of time throughout your day to feel peace. Thank you for sharing. Mirror image of what I’ve be experiencing lately. If you find a cure, let me know. Ok? Rebecca, this is a wonderful photo. Simple yet powerful. And your words are moving. I hope your autumn is better than your summer had been.